If you've ever been to a pro sports game, you know that there are some delicious foods at the concession stand: soft-serve ice cream in little helmets, fried dough, hot dogs... and pretzels. Oh gosh, the pretzels. Warm and chewy, soft and salty. Yummy. Whenever Joe and I go to a game, at least one of us gets a pretzel while the other silently wishes they had gotten one, too. We're huge football fans, and the season is in full swing here. 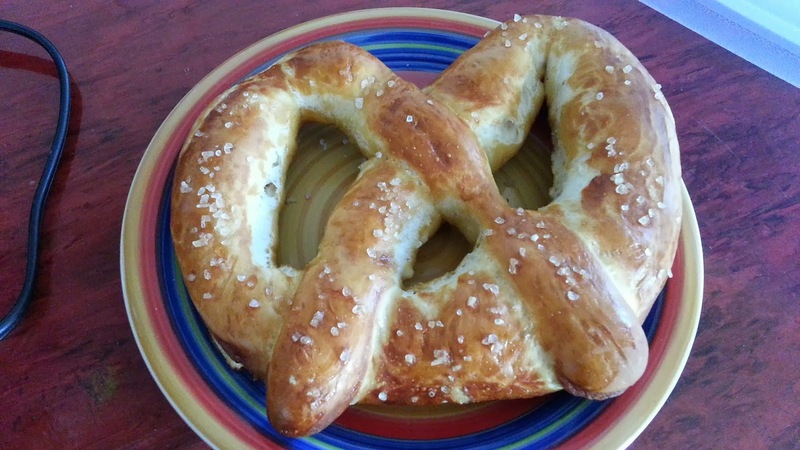 Pretzels are perfect football food because they're quick and easy to eat, but you can still cheer for your team while you eat one. Joe went to help a friend move this morning, and while I had the house to myself for a few hours, I decided to make my own pretzels. When I was a kid, my mom made us alphabet pretzels a couple of times, so we each got a little baggie of pretzels that spelled out our names. They were DELICIOUS, and I always thought they were the hardest things to make. False. 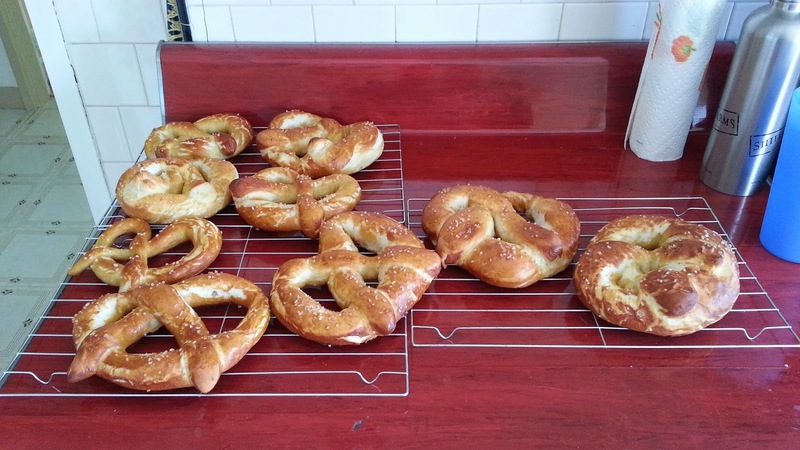 For me, the hardest part was twisting them into that familiar pretzel shape. Okay, so getting them out of the boiling water was a little tricky, too, but only because I made my pretzels huge and my slotted spoon isn't that large. Next time, I'm either making smaller pretzels OR I'm going to invest in some kind of larger spoon-strainer-scoopy thing. Like all yeast bread recipes, this one is time consuming in that it takes a few hours from start to finish, but for most of the time, you're not really doing anything. The active time on this recipe is maybe about an hour, but it's really broken up, so you have plenty of time to do other things, like try to beat that stupid level on Candy Crush or work out (guilty of both!). I like to eat my pretzels plain, but Joe loves his with yellow mustard or nacho cheese. I'm already thinking about making some cinnamon sugar pretzels next time. What's your favorite football/party food? In the bowl of a stand mixer, combine water, sugar and butter. Sprinkle yeast on top and let stand until foamy, about 5 minutes. Add 3 cups of flour. Attach dough hook and mix on low speed ("stir" if you have a KitchenAid), gradually increasing to medium speed (3 or 4) as the flour gets incorporated. Stop and scrape down the sides of the bowl as necessary. Mix in the remaining 2 cups of flour until the dough gathers around the hook and pulls away from the sides of the bowl. The dough will be VERY sticky. Turn dough out onto a floured surface and knead until smooth, adding more flour if necessary (I used about an additional 1/4 cup). and kneading until smooth and elastic - dough should not stick to your hands. Preheat oven to 425°F and spray baking sheets with non-stick spray. Punch dough down and divide and shape into an even number of balls, roughly the same size (I made 8 but could have made more for smaller pretzels). Roll each ball into a 24 inch long rope. Bring the ends together to start to form a circle, then twist ends once and lay over the opposite side of the circle, pinching the ends together to seal. In a large pot, bring water and baking soda to a boil. Carefully drop the pretzels into the boiling water. Cook for 30 seconds and remove with a slotted spoon. Transfer cooked pretzels to prepared baking sheets. In a small bowl, whisk together egg yolk and water; brush over pretzels. Sprinkle with coarse salt. 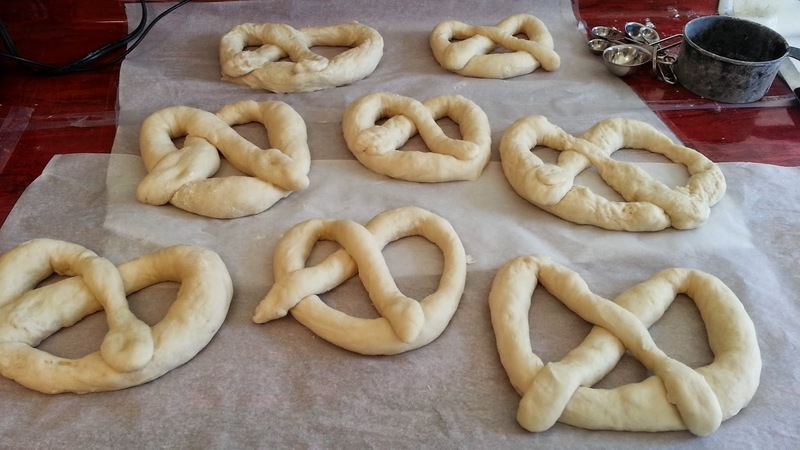 Bake 10-12 minutes or until pretzels are golden brown. Transfer pretzels to a wire rack to cool completely or eat once cool enough to handle. Serve with dipping sauce of your choice or eat plain. 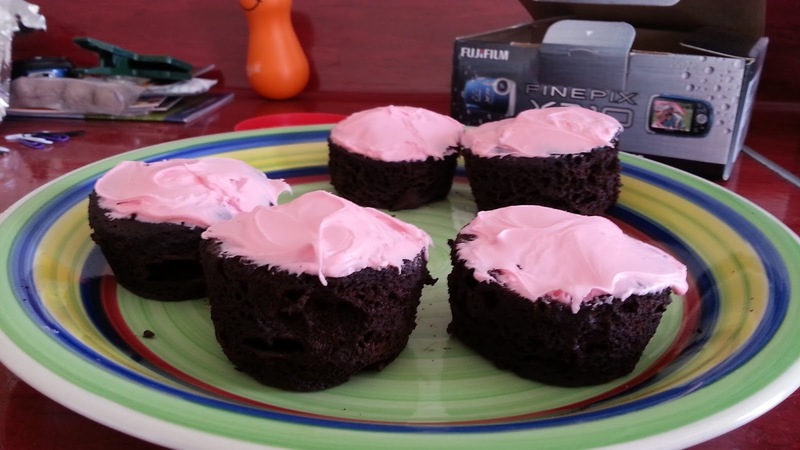 I feel silly posting these cupcakes on a baking blog - especially MY baking blog - because these aren't even baked. They're microwaved. I know. I was skeptical, too. But they seemed so easy that I figured there was no possible way these could go wrong. That, or they would be terrible and inedible, but then I figured I could just blame that on the microwave, too. On a somewhat serious note, I wanted to try this because it's pretty similar to the way Hungry Girl and others suggest you make a single serving of something - cake, cupcake, brownie, etc - but without having an open and partially eaten package of mix in the cabinet. The other thing I like about these is that if you don't tell anybody how you made them or that they only have 4 ingredients, NOBODY WILL KNOW! They're still as moist and fluffy and delicious as if you had just baked them that morning. Only you didn't bake them. You microwaved them. For a whole minute. Actually, I also like these because they're gluten free. And low calorie. I don't have the exact calorie counts, but there's hardly anything in them so it can't be that high. Technically speaking, I guess these would also be kosher for Passover (I know, I know - too soon! ), but it would depend on whether or not you believed that using baking soda to make these babies rise violates the "spirit" of chametz, but that's not something I'm going to get into today. They don't take a long time to make, so it's pretty easy to make a whole bunch of them for a party (which I did) in not a very long time at all - especially if you're low on ingredients. Speaking of which, these are ingredients that most of us probably always have in our cabinets and pantries, so it's nice to know that yes, you can quickly take care of that cupcake craving without having to make 24 tempting treats or without having to open an entire box of mix only to use a couple of tablespoon's worth. 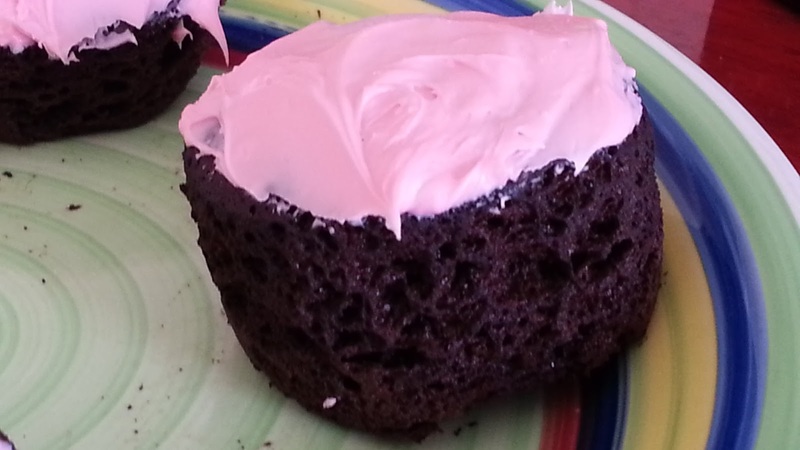 I topped mine with some leftover cherry frosting I had in the fridge (also gluten free), but you can also eat them naked or top with your favorite desert. I'm thinking ice cream would be delicious. Okay, that's enough of my rambling on about these babies. Go make them. When you're done, I want to know: what's your favorite few-ingredient recipe? Microwave both mugs for 1 minute. Cupcake is finished when the top springs back when lightly pressed and a toothpick inserted in the middle comes out clean (I have a 1000 watt microwave and only needed 1 minute). Run a knife around the outside of the cupcakes. Tip the mugs over and let cool completely. Top with your favorite frosting or eat them naked. Enjoy! Rosh Hashanah is the Jewish New Year. One of the ways we celebrate the new year is by eating apples dipped in honey, a literal representation of our wish for a sweet new year. While we traditionally dip bread in salt, this time of year, we dip bread in honey for the same reason. 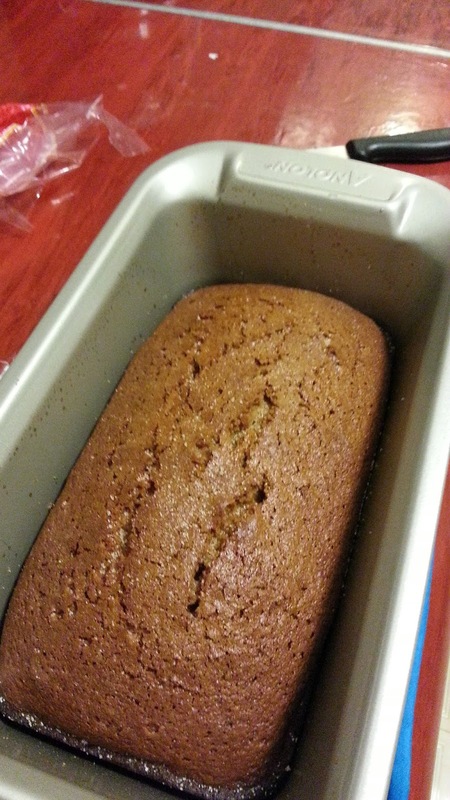 As such, one popular food item is Honey Cake. In Jewish school, we used to always make and sell these to our families and to the community. Putting a wonderful combination of Type A and Type B adolescent girls into the kitchen under the supervision of one strong-willed, patient and firm woman will certainly include a fair share of mischief (cinnamon challenge, anyone? ), but I looked forward to all of these - they were some of the most fun and challenging times I had in elementary and middle school. 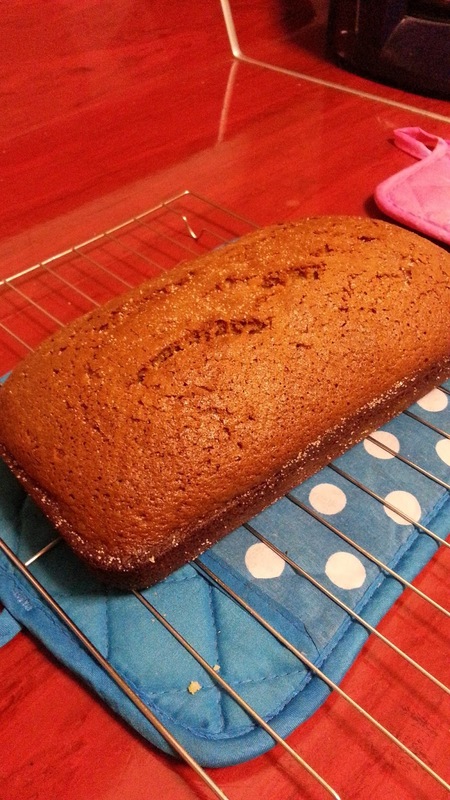 Unfortunately, school and grown-up obligations get in the way of a lot of things, so honey cake is something I haven't had the pleasure of making for many years.. until now. 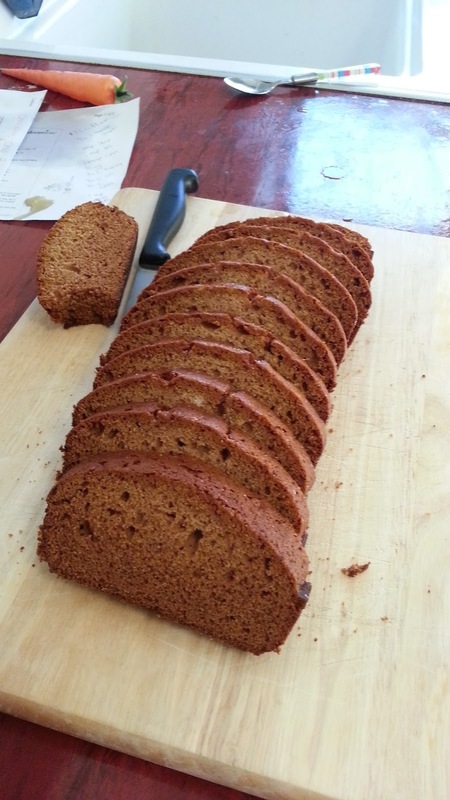 I've tried a few different recipes in the past, and none of them quite measured up to what I remembered making in Hebrew school: a dense, sweet, moist and delicious treat. Fed up with what I was finding, I decided to just make my own. I'm so glad I did. This one was perfect and exactly what I was looking for. Instead of orange extract, I think I'm going to try orange zest to make it the flavor pop a little more. If you don't like oranges, you can easily substitute lemons or leave it out altogether. Rosh Hashanah is the start of the Jewish High Holiday season, and I'm hoping to have some more recipes to share along the way. The rest of the holidays are around the corner, anyway, so - what's your favorite holiday recipe? In a medium size bowl, combine all ingredients except coffee. Batter will be very thick and hard to stir. Add the coffee and stir to combine. Batter should be easy to stir, similar to cake batter. Pour into a greased loaf pan. Bake at 325°F for 35-40 minutes, or until toothpick inserted in the center comes out clean. The cake should be a nice, golden brown color when it's finished. Wishing all of you a happy, healthy and sweet new year - L'shana tovah!